Lucerne Farms forage is a grain compliment, a fiber supplement, and a hay replacement! We carefully grow our own quality hay that is then bagged into compressed into a 30, 35, or 40 lb bag of forage perfect for your horse! The people at Lucerne Farms know how to grow the best hay for the needs of horses today. 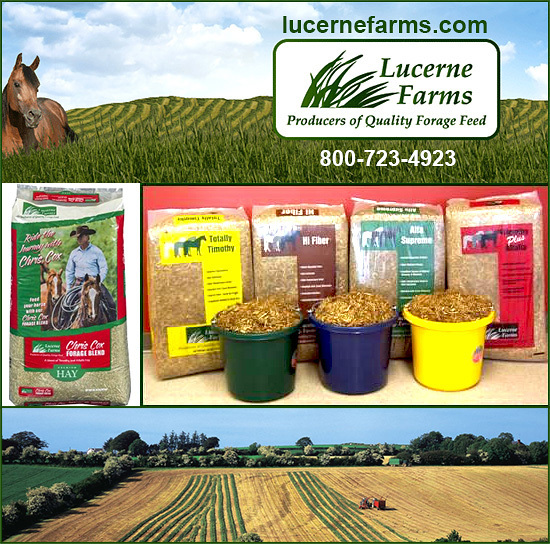 When you call Lucerne Farms, you speak with the people who actually grow the forage, as well as process this naturally good feed for your horse. With horses getting less exposure to grazing time, our blends allow your animal to maintain the health and wellness needed for their changing way of life. How Do I Know If My Horse Can Benefit From a Forage? Hay shortages, or when hay quality is poor, present ideal times for replacing hay or supplementing with Lucerne Farms Forages. Horses with Respiratory problems or Dental problems can benefit from the short chopped, soft, dust free forages. Our forages are often recommended by veterinarians for respiratory problems, Laminitis, Ulcers, and Post Operative situations. If your horse ‘bolts’ his grain mixing forage with the grain can help these horses slow down and take more time to chew. What Sets Lucerne Farms Apart From Other Forages? What If I Have A Horse With Ulcers, Laminitis, or Chronic Colic, Can Lucerne Forage Help? Many Veterinarians recommend Lucerne Farms Forage for a variety of reasons. Post colic surgery is a common example due to the digestibility of the short chop and easy digestion of our forage. Alfalfa is helpful to buffer stomach acids in horses prone to ulcers. Always confer with your Veterinarian when dealing with chronic conditions. My Horse Has Heaves and Other Respiratory Problems, Can Lucerne Farms Forage Help? Horses suffering from respiratory problems and allergies associated with field-dried hay benefit by feeding our forage feeds. The high temperature drying process eliminates harmful mold spores that can lead to respiratory allergies (heaves), resulting in a chronic cough and decreased physical performance ability. Feeding your horse any one of Lucerne Farms high temperature dried forages may help prevent an allergic cough and keep his airways clear. What If My Horse Is Insulin Resistant, Can Lucerne Forages Benefit My Horse? Two of our forages are nutritionally designed to benefit metabolic issues in horses, EquiSafe and Hi-Fiber Gold. These forages consistently have low NSC values which are one of the hallmarks for caring for these horses. Is It True That Lucerne Forage Can Help My Horse With Coughs and Allergies? Why? Horses with dust and mold allergies respond well to the Lucerne Farms products. High temperature drying effectively ‘locks in’ the natural nutrition while destroying harmful mold spores that can cause respiratory problems and allergies. The molasses mixtures have the added benefit of reducing any chaff issues that can irritate some horses. What If My Horse Is Perfectly Healthy? Can He or She Still Benefit From Lucerne Forages? Absolutely! The horse evolved as grazing animals well adapted to eating high-quality forage (grasses and hay). Many mature pleasure horses can thrive on forage-only diets. The more nutritious the forage in a horse’s diet, the less he’ll need of grain, concentrates or supplements. Our forages are harvested early and high temperature dried “locking in” the natural nutrition. I Have a Senior Horse Dropping Weight, Can Forage Help? Yes! As the horse ages, the digestive system becomes less effective. Adequate chewing is the first step in the digestive process, becomes less effective because teeth are worn. This can result in loss of body condition and weak bones. Older horses need highly digestible sources of protein and calcium to make up for these losses. Our short chopped forage fills this need by making it easier to chew and digest than common long stem hay. How Much Forage Do I Use To Replace 2 Flakes of Hay? When feeding forage versus long stemmed hay you must use the weight method. Horses need 1.5-2 % of their body weight in forage daily just for maintenance, and it may increase in need depending on the amount of work they are doing. A good rule of thumb if you do not have scales is to fill a five-gallon water bucket to the top to get approximately 5 pounds of forage. Few people weight the hay they feed. So for example a 1,000 lb horse should be getting 15 to 20 lbs of hay per day minimum just for standing around. Note: If feeding as a complete hay replacement feed about 1-1.5% of the horse’s weight, when fed as a fiber supplement, usually 4-6 pounds a day for an average horse will do and Less if only a partial hay replacement or as a supplement. Do I Need To Feed Supplements With My Forage? Depending on where you live, what stage of life your horse is in and the amount and kind of work they do daily dictates what they may need for supplements. For an example we live in Northern Maine and Maine is a Selenium depleted area of the country. Certainly people who have breeding mares and foals, heavily worked horses, and performance horses need to be advised by their Vet for Selenium needs for their animals. You can talk to your vet and he or she can advise you. What Forages Does Lucerne Farms Have to Offer? * High Fiber— a measured blend of Timothy, Oat Hay, Alfalfa Hay, Cane Molasses at 9% Protein. * Alfa Supreme- An excellent source of Vitamins and Minerals essential for brood mares and growing horses with 15% protein. * Timothy Plus Alfalfa- perfect for the performance horse, supplies a slow release energy to working muscles during exercise and competition. 12% Protein. * Chris Cox Forage- this molasses free blend for the performance horse which supplies a slow release of energy to working muscles during exercise and performance. Timothy, Alfalfa and 10% protein. * Premium Hay- our Premium Hay is a short chopped blend of Timothy and other hays. Left “naked” this blend is perfect for horses needing a grain complement, fiber supplement or hay replacement without either molasses or soybean oil. Not considered dust free. Where Can I Buy Lucerne Farms Forages? You are welcome to call, check with your feed store or check our popular Dealer Locator to find the store nearest you. If your feed store doesn’t offer Lucerne, be sure to ask them to call us and we can help them! Just call us today and tell us about your horses!